In recent years, health literacy is increasingly viewed as aligning complexities and tasks with people’s skills and abilities. With this understanding of health literacy, there comes a growing recognition that we, as health care providers, need to improve our communication skills. Moreover, an emerging body of research documents an evidence base for making information more navigable, understandable, and useful to patients. Many now argue that the Plain Writing Act of 2010 should extend far beyond the mandate for the federal government to use plain writing in public documents to include all documents issued to the public. Plain writing and clear communication are essential to the transmission of health and health care–related information; improved clarity leads to diminished confusion and better health. Nevertheless, even if we were able to achieve this goal, a significant portion of our country’s population would still not be able to actively engage with the health care system. Efforts to deconstruct and address layers of unnecessary complexity through user-centered design are part of today’s efforts to operationalize health literacy. Those working to advance health literacy value patients’ perspectives and are forging methodologies to meaningfully include patients, the ultimate experts, in co-designing content and processes that align with their needs, values, and skills. 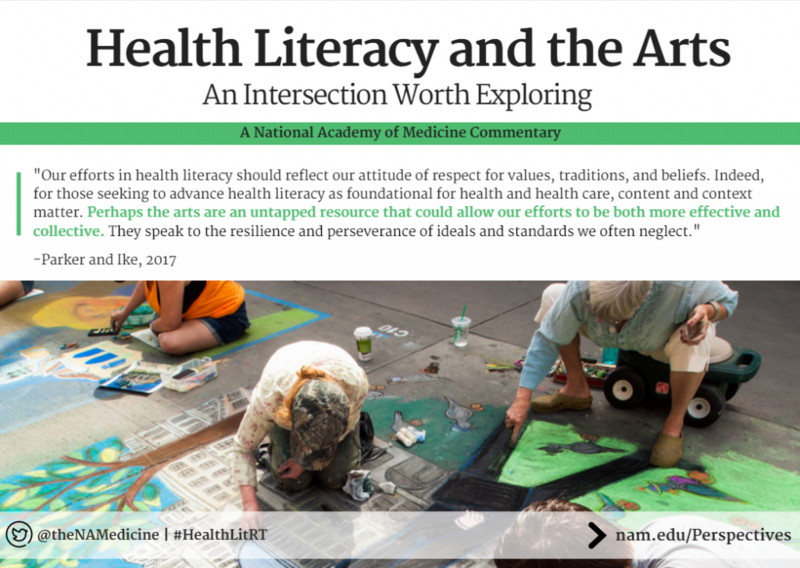 To date, the vast majority of research in health literacy has focused on textual literacy—the written and spoken word—and how it is accessed, understood, and used. Of note, health literacy is content and context specific. Hundreds of published studies now document the growing evidence base for how to create health-literate content and processes. These efforts reflect the quality aim of being “patient centered.” Understanding and addressing context—how values, traditions, and beliefs affect content—is likewise fundamental to improving health literacy. Yet significantly less effort in the field of health literacy has been devoted to addressing circumstances that define context, as evidenced by most research’s focus on textual literacy. In this paper,­ we offer our view that the arts are an underexplored source of understanding and communicating context. The arts communicate contemporaneously and speak to compassion, healing, values, and health across time and cultures. 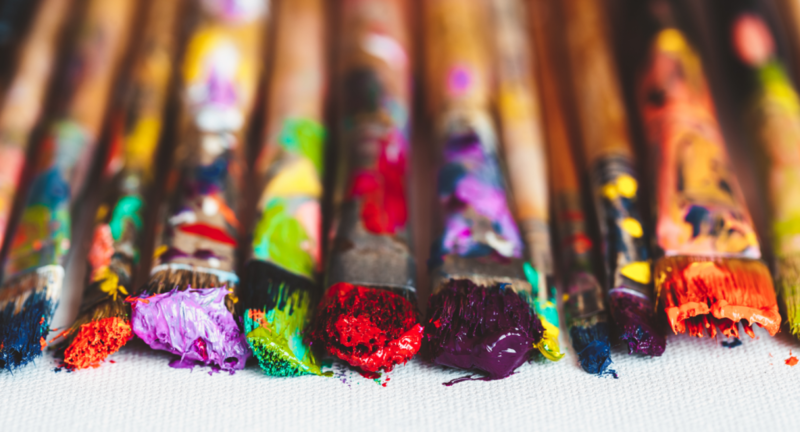 Perhaps closer consideration of the arts and health literacy can broaden our thinking about how we align health-related content with the broader context of people’s skills, abilities, values, and traditions. Most would agree that art communicates, but few actually turn to the arts to “listen” for insights that inform us about who we are as individuals and as people within a broader society . Fewer still are those who would contemplate the arts as a resource for supporting and communicating contextually about health. Our health care systems—increasingly intricate landscapes of impersonal technologies and complex systems—are struggling to reduce disparities, improve quality, and control costs while simultaneously remaining both “patient centered” and “community based.” The arts can teach us how to listen, increase our awareness of humanity’s interconnectedness, and inform us of our identity: who we are, what we value, and who we aspire to be in the future. In his article about the frequently disputed, yet enduring, WHO definition of health, Callahan notes how the definition “implies that there is some intrinsic relationship between the good of the body and the good of the self.”2 The definition first used in the preamble of WHO’s constitution resists specific categories, urging us to regard health as a “felt experience .” The word health derives from the Old English root hale, which is of Germanic origin and is related to the whole. This consideration of the term health, its origin, and its meaning over time compels us to ponder the broader context of health. The arts may help us visualize and take note of the ecological spectrum that defines the health of an individual, of a community, and of a nation. The arts also grant us a perspective that transcends time—a window into people’s values and beliefs in the past, our shared present, and an unknowable future. To further explore how the arts help us understand context, we offer two examples: a fresco cycle in Santa Maria della Scala, a twelfth-century hospital in Sienna, Italy; and Andrew Cozzens’s Smoketown Lifeline Project. His is a recent work of art created for Project HEAL (Health. Equity. Art. Learning), IDEAS xLab’s “approach to operationalize artists’ potential as creative agents of change toward a societal goal of health [3,4].”For each example, we note how the arts inform the individual, the community, and policy makers. Santa Maria della Scala is a civic hospital (now a museum) founded in Siena, Italy, in 1193 to care for orphans, pilgrims, and the poor . Located directly across from Siena’s principal cathedral in the Piazza del Duomo, the hospital is a central structure in this city first settled by the Etruscans. The origin of the hospital relates to the increasing flow of pilgrims to and from Rome on the via Francigena in medieval times. Priests made clear the obligation to care for the poor through charitable works, and this ospedale grew to become the area’s largest agricultural business whose land holdings were accrued to support its mission. In the entrance hall of the hospital is a magnificent fresco cycle that depicts the founding of the hospital and its role in caring for pilgrims, orphans, and the sick. Painted in the early fifteenth century shortly after the Black Death wiped out much of the European population, the frescoes communicate the duties of the hospital and transmit the values of the institution and the Siena community at large. In one panel, a physician intimately cradles a dying patient during his final moments. In another, health care staff share a meal with patients at a collective dining table. In another, wet nurses care for abandoned children who appear plump and vibrant. These images are but three examples that communicate to a largely illiterate population that they are welcome and will be cared for with compassion. To the community, the art speaks to civic duty and responsibility. The frescoes in this space define and project values, ideals, and traditions; they actively engage the viewer. To a modern audience, they afford an understanding of context; we can morally imagine entering this space as a fifteenth-century citizen. Moreover, their message is timeless. We comprehend and preserve, for hundreds of years, the ideals portrayed. Similar health-related artistic efforts are seen in various projects today. The Smoketown neighborhood in Louisville, Kentucky, is close to many local hospitals, but members of this community are expected to live, on average, nine fewer years than other residents of the city . Andrew Cozzens, a sculptor, in conjunction with Project HEAL, sought to make this health statistic tangible to Smoketown’s citizens, the community at large, and the policy makers whose decisions affect population health. In addition to awareness, Cozzens hoped that his art would provide a means to heal. In his work, Smoketown Lifeline Project, Cozzens depicts 20 discrete rods, each representing a citizen in the community whose life ended prematurely . Each rod contains “crimps” marked with discrete bands of color that represent adverse experience in someone’s life—violence (red), addiction (white), incarceration (black), trauma (blue)—viscerally evoking the elements in disadvantaged communities that often contribute to morbidity and mortality.3 This tangible depiction of time is central to Cozzens’s work, as he “aim(s) to create a visual situation in which the time duration of the work becomes an experience rather than a measured interval .” Cozzens’s work captures what is often hard to voice by those marginalized: it speaks of equity. Furthermore, his sculpture provides a visualization of context and affects our understanding of this community. We can begin to understand health in Smoketown not only through statistical reports, but from the arts that its citizens produce. The benefits of Cozzens’s work and Project HEAL have been far reaching. Through depicting disparity concretely, the work has offered a forum for community members to gather and discuss the negative effects of trauma and poverty within their community. Individuals are able to relate their experiences to those of others; through collective engagement, healing is possible. Moreover, the work creates opportunities and channels of dialogues between Smoketown’s citizens and the Louisville community at large. Using art as a tool for engagement and awareness, Project HEAL and Cozzens hope that such efforts will have wider-reaching policy implications; art can promote health equity. Similarly, albeit separated by nearly 600 years, the superbly preserved fresco cycle that tells the story of Santa Maria della Scala speaks to the values of the Sienese citizens historically and today. It remains a visual instruction to the modern viewer on the origins of the word hospital—ospedale—which means “to host.” Art is timeless and continues to communicate. It affords us an appreciation of context because art is intimately coupled with the communities and artists that produce it. Art is power. We preserve it. We approach it with awe and respect. We try to understand it, and sometimes find it the only thing that can allow us to live in the past, the present, and the future simultaneously. The arts require us to pause and reflect. C. S. Lewis noted that “the first demand any work of art makes on us is surrender. Look. Listen. Receive .” We are to judge a book not by how it is written, but rather by how it is read. And reread. Thus, with the arts broadly, we revisit and reconstruct their messages, their beauty, and their timelessness. The arts reflect humanity, and that is context. Our efforts in health literacy should reflect our attitude of respect for values, traditions, and beliefs. Indeed, for those seeking to advance health literacy as foundational for health and health care, content and context matter. An attitude of respect, of humility, and of a genuine willingness to listen to, partner with, and learn from those whose health we seek to improve matters. Perhaps the arts are an untapped resource that could allow our efforts to be both more effective and collective. They speak to the resilience and the perseverance of ideals and standards we often neglect. In science and medicine, we value deconstructing and analyzing to understand. The arts offer us a different way of knowing. Bridging the challenges of our unique lenses to advance health seems an underappreciated opportunity. Parker, R. M., C. A. Labrecque, S. G. Candler, et al. 2013. Communicating through the arts: lessons for medicine and public health. 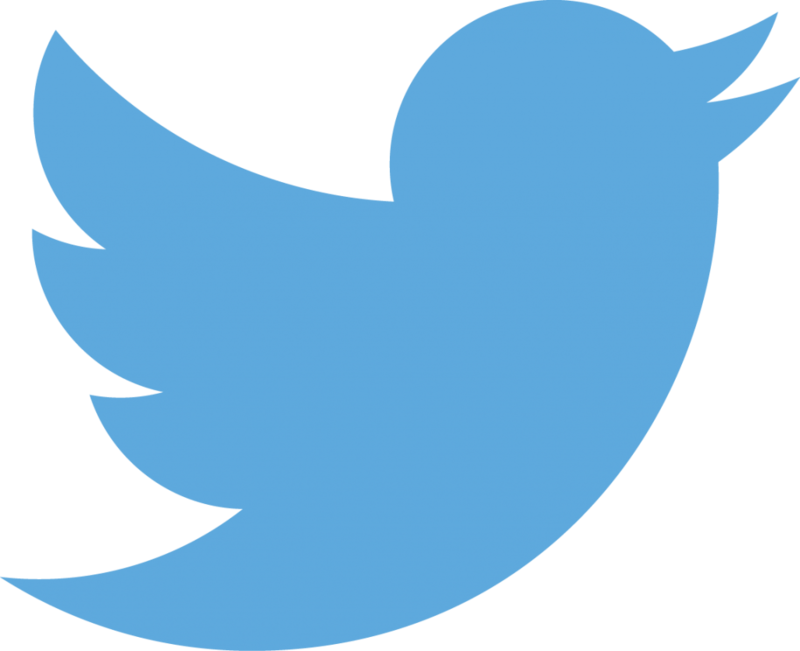 Journal of Healthcare Communications 18(2):139–145. Callahan, D. 1973. The WHO definition of “health.” Studies—Hastings Center 1(3):77–88. Miller, J., and T. Edmonds. March 2, 2017. Four ways artists can help heal communities. In Culture of Health (blog), http://www.rwjf.org/en/culture-of-health/2017/03/four_ways_artistsca.html. Ed. by Robert Wood Johnson Foundation. Robert Wood Johnson Foundation. IDEAS xLAB. 2017. Project HEAL (Health. Equity. Art. Learning). http://webcache.googleusercontent.com/search?q=cache:K9u54M0pUWEJ:www.creativeagentsofchange.org/project-heal-1/+&cd=1&hl=en&ct=clnk&gl=us (accessed April 28, 2017). Santa Maria della Scala. 2017. http://www.santamariadellascala.com/contatti (accessed April 28, 2017). Cozzens, A. 2017. http://andrewcozzens.com/home.html (accessed April 28, 2017). Lewis, C. S. 1961. An experiment in criticism. Cambridge, England: Cambridge University Press. Ruth Parker, MD, is a Professor of Medicine, Pediatrics, and Public Health at Emory University School of Medicine. She is also a member of the Roundtable on Health Literacy. John David Ike, MD, graduated from Emory University School of Medicine in May 2017. He is currently an internal medicine resident at Duke University Health System.